Spartans claimed the North Edinburgh bragging rights for the first time this season by running out 2-0 winners over Civil Service Strollers in the sunshine at Christie Gillies Park. Dougie Samuel’s team were looking to bounce back from their midweek defeat at East Kilbride, which handed Kilby the league title. They outlined those intentions in the opening minutes as Blair Atkinson linked up with strike partner Jack Smith to good effect before the latter had his shot well saved by Josh Donaldson. The visitors were dealt a blow when Smith was forced off injured, holding his hamstring after just 20 minutes, with Stephen MacDonald coming on as his replacement. And the American frontman made an impact as his flick-on sent Atkinson clean through on goal two minutes before the interval. The youngster displayed neat composure as he slid the ball low past the outstretched keeper. MacDonald was at the forefront of most of Spartans attacking play and he again caused the Strollers rear-guard problems with his arial presence in the 75th minute. A long ball forward caused panic in the Strollers box with keeper Donaldson caught in two minds whether to come out and collect it with MacDonald lurking, and defender Kevin Waugh was the unfortunate player who saw the ball ricochet off him into the net. Aktinson then rattled the woodwork and substitute Jason Stevens headed narrowly over the crossbar as they went in search of further goals late on. The victory moved Spartans to within three points of their neighbours with two games still in hand, and ended Civil’s five-match unbeaten run in the process. “It had the makings of an exciting derby on paper, but I felt we did enough to merit the points,” stated defender Blair Tolmie. “Civil have been flying lately in the league and are still the only team to have beaten East Kilbride this season, so we knew it was going to be a really difficult game. “Gary (Jardine) has them very well organised and when we drew with them a few months ago we found it tough to break them down. “Our performances recently have been a lot better, but we had to take it to another level going to Marine Drive. We’ve got a few games in hand over Civil and Kelty and we want to finish as high as we can. “It’s still a massive goal of ours this season to bring some silverware back to the club. Unfortunately, our league form wasn’t good enough during the first half of the season, but we’ve put that behind us now. “We’re in the Football Nation Cup Final and there is the League Cup at the end which will almost act as a fresh start for most of the teams. Elsewhere, Whitehill Welfare lost 3-0 at home to East Stirlingshire but the Midlothian outfit avoided automatic relegation for at least another couple of days after Dalbeattie could only draw 0-0 with Stirling University. Goals from Steven Brisbane, Ross Allum and Paul McCafferty handed Shire maximum points to leave the Ferguson Park men clinging on to their league status. However, barring a monumental goal swing in their favour during the final run of fixtures, Ian Little’s team are likely to accept defeat in their battle to avoid the drop into the East of Scotland League. Meanwhile, Edinburgh University battled past Gretna 3-2 to notch their first domestic win in over four months and their first at East Peffermill since October. 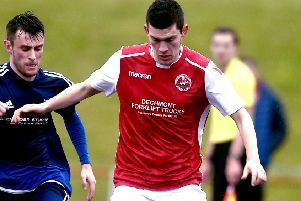 Dorian Ogunro’s squad had shown signs of a revival in recent weeks having held BSC and Cumbernauld to draws and performing well against champions East Kilbride. The Students fell behind early on to Dean Watson’s tenth minute opener before a double from Ross Watters and one from defensive midfielder Mark Waters turned the game on its head. Kevin Connelly pulled a goal back for the Borderers with 13 minutes remaining, but the hosts held firm to register a welcome three points.